PITTSBURGH — Matt Murray stopped 36 shots to remain unbeaten since his return from a lower-body injury, Riley Sheahan and Bryan Rust scored short-handed goals in the second period and the Pittsburgh Penguins stopped the Florida Panthers 5-1 on Tuesday night. Aaron Ekblad collected his ninth of the season for Florida and the 62nd of his career to set a new franchise record for goals by a defenceman. The Panthers dominated play for long stretches only to be turned away repeatedly by Murray. Pittsburgh counterpunched expertly against Roberto Luongo, who finished with 12 saves on 16 shots before being pulled after Sheahan’s unassisted score 8:56 into the second period. The Panthers did their best to retaliate thanks in part to some sloppy play in the defensive end by the Penguins. Yet the 24-year-old Murray — who struggled with both injuries and inconsistent play during the opening two months of the season — kept Pittsburgh’s advantage intact with occasionally spectacular play. He stopped a short-handed breakaway by Colton Sceviour near the end of a busy first period in which Murray faced 15 shots. 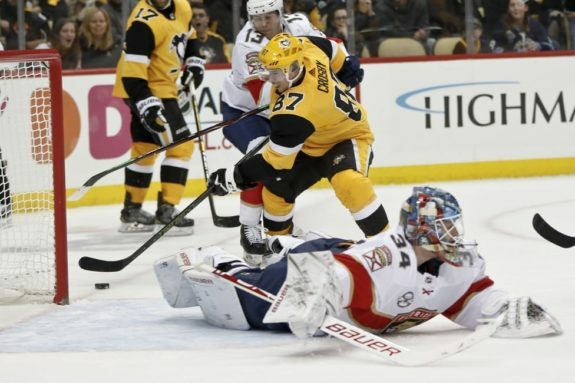 Ekblad appeared to get Florida on the board moments later, but his one-timer was overturned on replay after Pittsburgh successfully challenged that the Panthers entered the offensive zone offsides. The 22-year-old’s point shot with 44 seconds left in the second did count, pushing him past Robert Svehla for the most career goals by a Florida defenceman.